The word Divination shares the same Latin as divine, meaning sacred, godly or pertaining to the heavenly realm. Divination is a sacred art, it is the means by which we can discover the unknown (or what is hidden) by means of intuition, inspiration or magic. In ancient times it was very much a part of both religious and secular life. In Old Testament times, for instance, the Priest would cast stones or lots when important decisions had to be made, while in the Ancient and classical world, oracles were regularly consulted to assess the best time for an undertaking or to predict the outcome of a course of action. In all cases it was believed that God or the God’s were speaking through the divining tool. There are a variety of different methods by which the doors to my own Psychic abilities are opened in a way that permits my intuition to work. Divining with the Tarot involves reading the cards in a specific situation. The person, who has the reading, mixes the cards, ending by bringing the deck together and cutting it into three piles, which the diviner takes up. The power of the reading comes from the reader’s ability to “see” and communicate the message in the fall of the cards and the inquirer’s openness to the movement of the images. I use a variety of Tarot Cards in all of my readings. Reading Tea Leaves, “scrying” from the shapes and positions of a teacup, is a more domestic form of the wise woman’s Cosmic Mirror. It has been used in Europe since the introduction of tea in the 18th century. The Gypsy woman who called at the door to “read” for the woman of the house was a popular Victorian figure. I have done readings with the tea laves since I was a child. My Grandmother was the one who passed it down to me when I was very young. The Crystal Ball is a powerful tool when used in a reading. If someone is looking for a more in-depth reading, about the Past, Present and the future, then I would suggest the Crystal Ball. It takes a lot of spiritual energy for someone to read the Crystal Ball, as it requires the person reading it to go into a deep spiritual trance, in order to see images appear. From the earliest times, people have seen supernatural images in shiny surfaces such as a pool of dark water a concave mirror or the Crystal Ball. This process is called “Scrying”, which means “perceiving”, and it is an art that many Psychics aim to master as a way of answering questions about the future. Runes are said to have appeared to the Norse God Odin, during a Shamanic initiation rite. The Runes then became his gift of knowledge to humanity and as such they are empowered with ancient wisdom. The word “Rune” comes from the Middle English runa, meaning “A whisper” or “A secret”, and traditionally knowledge of the runes was granted only to a Rune Master, who guarded it closely. Rune Masters underwent many initiatory experiences to discover the secrets of Rune lore. I use them for divination, magic and healing work. Dowsing is essentially the art of asking a “Yes/No” question and using the movement of a dowsing device- usually a pendulum rod- to divine the answer. It is a simple process that I use, like a doorway between the mind and spirit. 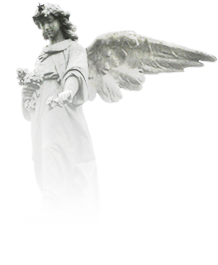 Our Angels communicate with us in many ways, through signs that we may see, hear or feel, but they mostly guide and comfort us through our own inner knowing- our instincts. I have a selection of beautiful Angel Cards that I use with each reading. Each beautiful card has a full Angelic message for you, plus a comforting quote to carry with you throughout your day. A past life reading is when a person gifted with the ability to see the past looks into your past lives for you and relates that information to you. Past life regression is unmediated revelation through hypnosis usually assisted by a regression therapist. However, past life regression is not always accessible to those who cannot be hypnotized because the interpretive reality of the ego is too strong. Past life readings may be attractive to those that prefer a less subjective experience, or for those that mistrust their ability to see. The revelation of past life readings depends only on the reader's gifts. The amount of details seen vary among readers. When I see a past life, I see it rather like a video. I am able to fast forward through the years and decades, pausing at certain time frames and focusing on important events. The key, however, is my ability to perceive the emotional content of the people involved. This is important because unresolved emotional issues that are carried from one life to another can be either impediments or guideposts on our individual paths. Whether an issue is a guidepost or an impediment depends only on the level of awareness and open-mindedness with which it is approached. I have done Past Life Readings for a number of years now; and people have always commented on how it has helped them understand their lives today. There is no need to use Regression if the person doesn’t feel comfortable with this. I have used the Tarot Cards and Crystal Ball to do past life readings, and it has been just as effective if not better.